During the Cricket Showcase we ran into some Technicians that made the long journey from Cleveland to Austin, Texas to showcase their music as the band Tropidelic. 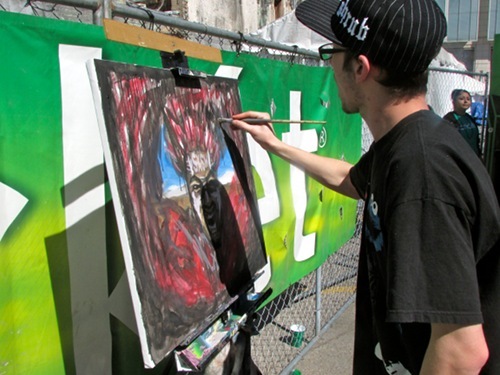 They were hard to ignore due to an amazing piece of artwork that was being crafted to the side of the stage. 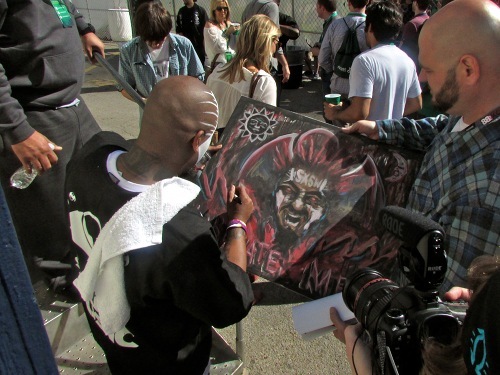 Artist Justin Roberts was on his Rob Prior when he painted live to Tech N9ne’s first performance at SXSW 2014. 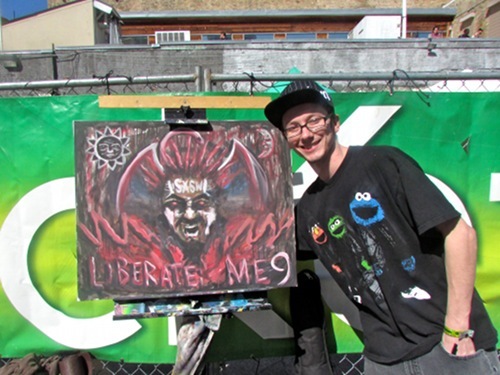 The decision was spontaneous, as he was traveling with Tropidelic to SXSW to perform anyway, but hearing that Tech was going to perform he set up his canvas and started painting on the spot. Bandmate Vinnie Lombardi was the first to catch wind of the showcase and made sure that the extensive crew was on board to see the performance. The man with a Snake and Bat tattoo on his arm to go with one of the band name is no stranger to Tech N9ne and his music, having been down since he got the sampler during Absolute Power tour. The showcase was the ninth time that Lombardi had seen Tech perform, but the first time that Matthew Rhodes, another member of Tropidelic had seen the Kansas City King. His first impression? The show is incredible. For a two man crew they’re holding it down up there. It’s high energy. The call and response is on point and it’s good and I’m a critic. For no DJ and no live band this is top notch, a plus performance. Better than anybody else doing it. 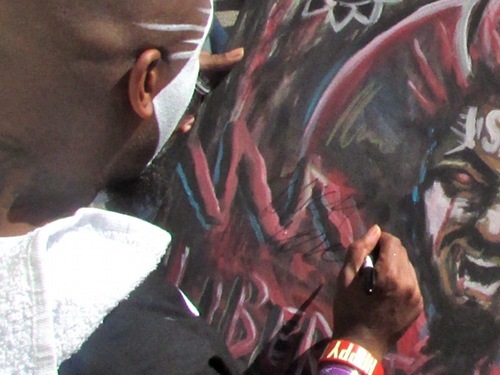 After the painting was finished we had none other than the inspiration for it give it the finishing touch, as Tech N9ne signed the piece after the showcase. 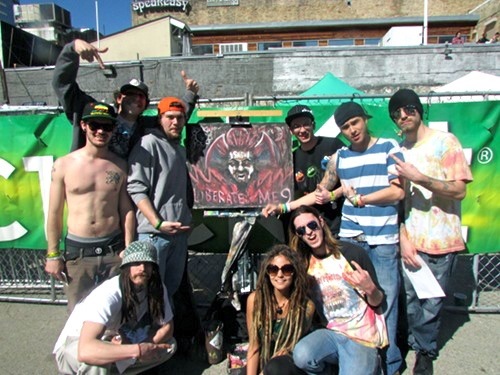 Shout out to the whole Tropidelic crew and all the other Technicians that showed up to SXSW to support Tech N9ne and Strange Music! – What do you think of the painting? 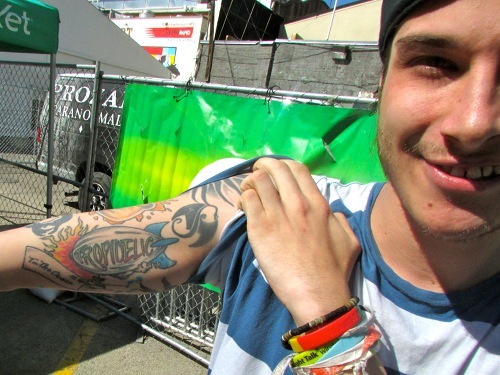 – What are your thoughts on SXSW?